We just lost Marian a few days ago. 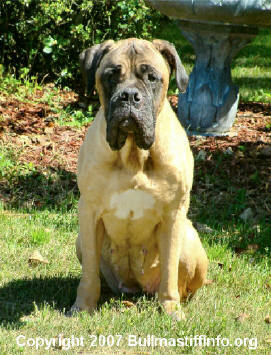 She was our fourth Bullmastiff and her death was in no way easier than our first, second, or third Bullmastiff. So, as an avid lover of this breed, how do we, as owners, comfort ourselves and our family after we have lost the love of our beloved companion(s)? Every religion teaches that our ultimate goal in life is to advance to the spirit state to be with our God. Therefore, why do we grieve when a beloved member of our family passes? Should we not be celebrating that they are moving on in the spiritual world and advancing to that next level? Yes we should. With Marian's passing, we chose to celebrate her memories of her life with us. She loved us dearly and we loved her just as much, if not more. We realized that our grief was over all of the things we would not be able to receive from her any longer while she was in her earthly state. We will miss her hugs and kisses every morning and night. We will miss her joyous greetings every time we came through the door. We will miss her devoted attention as we spoke our secrets to her. We will miss the comfort of her heartbeat as we cuddled up next to her. ...And we will celebrate that we were able to have all of these moments with her. To know her. To learn from her. To have her become a part of our being. And finally, to realize that we have so much more love to give to the next deserving soul. We shall not be selfish and isolate ourselves from feeling the pain of losing another Bullmastiff to the natural course of death. We shall give of ourselves and open our home again to a loving soul willing to love us just as much as we will love him/her. Because as owners of the Bullmastiff breed...we know...that this breed cannot live the lifespan that us humans do. But, we also know, they can love just as powerfully as we do. And even in death, they continue to live on inside of us. To all of the Bullmastiff owners throughout the world. May you find comfort in the memories of your Bullmastiffs passed. May you find comfort in knowing that your companion(s) are well and with God and watching over you. And may you find the strength in your heart to share your love with another companion and show him/her the same beautiful life you shared with your companion(s) before. So that they too, will find joy in living life in their short time with us here on earth.